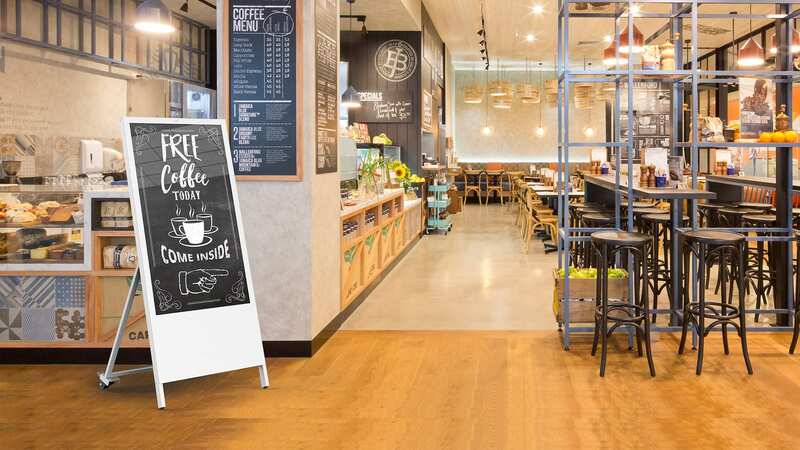 Stand out from the crowd with this innovative portable digital signage solution. A mains plug is no longer needed for you to deliver your digital messaging, opening up a whole world of new possibilities. The Digital Android Battery A-Boards come with a built in HD Android media player, allowing you to update them using a USB memory stick. Load your pictures and videos onto a USB memory stick then insert it into the display, which will copy the files into its internal flash memory. Once you remove the memory stick the screen will then start playing the pictures and videos in a continuous loop. The integrated lithium-polymer battery revolutionises the way you can use digital signage. This commercial grade slimline battery solution gives you over 12 hours running time. Fitted with a commercial grade panel, with a lifespan of 70,000 hours, and using high quality components ensures that the high brightness monitor displays can be in constant use 24/7. The high brightness LCD panel used in this display is up to three times brighter than a domestic TV making it ideal for brightly lit public spaces. The display has a light sensor that changes the screen’s brightness depending on the ambient light ensuring the most suitable brightness depending on the environment. The eco-friendly power timer allows you to assign daily or weekly on and off times for your screen. The ability to power on and off automatically means that the screen is only in use when it needs to be; improving your environmental efficiency. These freestanding displays are a fully portable solution and can be easily moved by one person as they feature fixed castors. These wheels can be locked to prevent the screen from moving once in place.